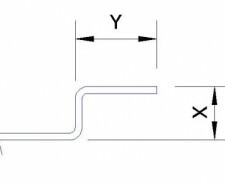 Small Joggles formed in sheet metal work from 0.7mm to 3mm thick and up to 140mm in width. Material Gauge Mild steel, Zintec, Galvanised Steel, Aluminium Alloys, Stainless Alloys, Brass and Copper. We can adjust this press tooling to enable us to vary the height of the joggle (dimension x) from it’s minimum to maximum dimension in the table above. As the 2 bends of the joggled section are pressed into the sheet metal work in 1 operation this will help to keep the costs down for you and it makes it easier for us to maintain the accuracy of the dimensions in production. Once dimension x increases in the joggled formed in the sheet metal above the maximum shown in the table we have to put the 2 bends into the sheet separately. This then becomes an operation for one of our CNC press brakes. 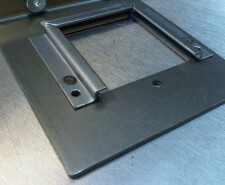 For sheet metal work over 140mm long please see our CNC “Z” bend table.